Autumn has gone awry! First snowfall of 2011 occurs on October 29th! Nature tricked! We have not even raked the leaves and now we must clear the snow! For ONCE we did not lose our power though half of our town is not so lucky with trees and power lines down all over! Just two days ago I was taking photos of Autumn for a post. 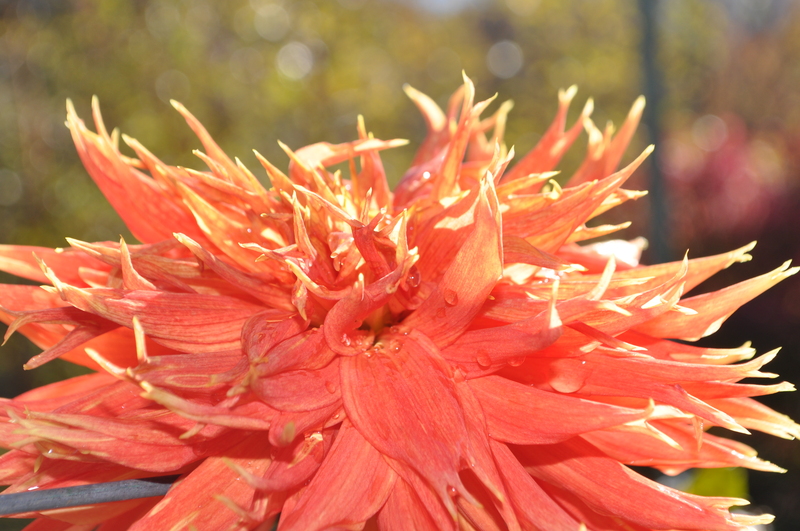 The dahlia foliage was still green, the dogs were still basking in the sunshine. 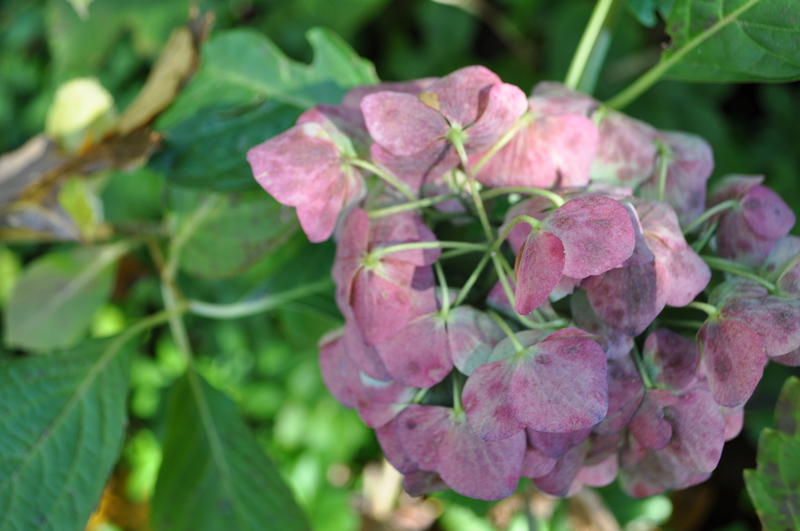 I was noting the fading hydrangeas, the muted colors still attractive. Then an odditiy occurred yesterday – it began to snow! Last night, we made a fire and streamed a movie and (with power) it felt quite cozy and romantic. Hurricane Irene is not yet a distant memory; I am feeling badly for the other half of our Town without power. Reports are that it could take a week to fully restore power! 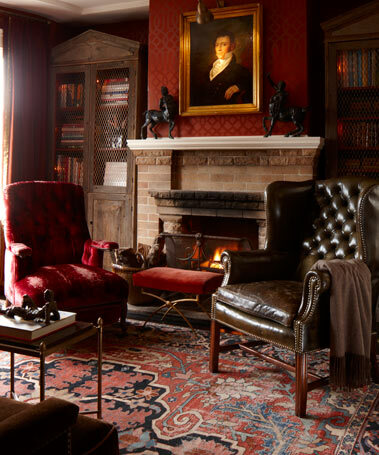 Heather at Habitually Chic has a wonderful post on fireplaces today if you’d like to see more like the scene above! 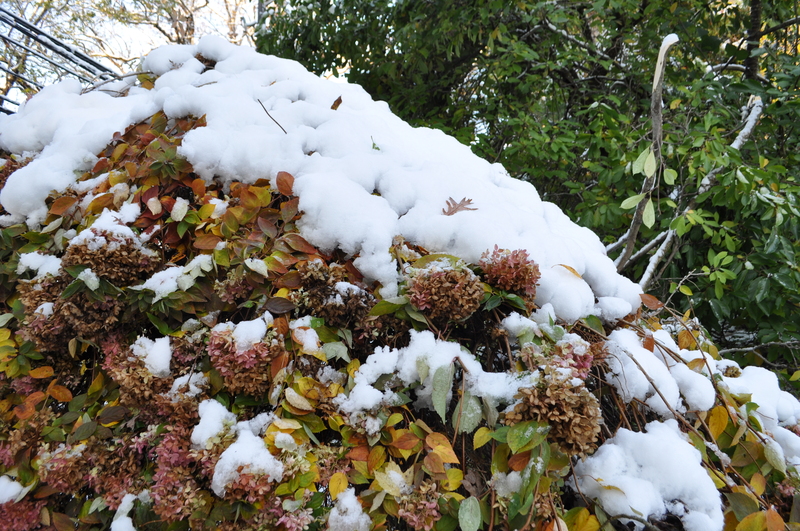 The snow continued overnight, by this morning the hydrangeas were bent with snow. 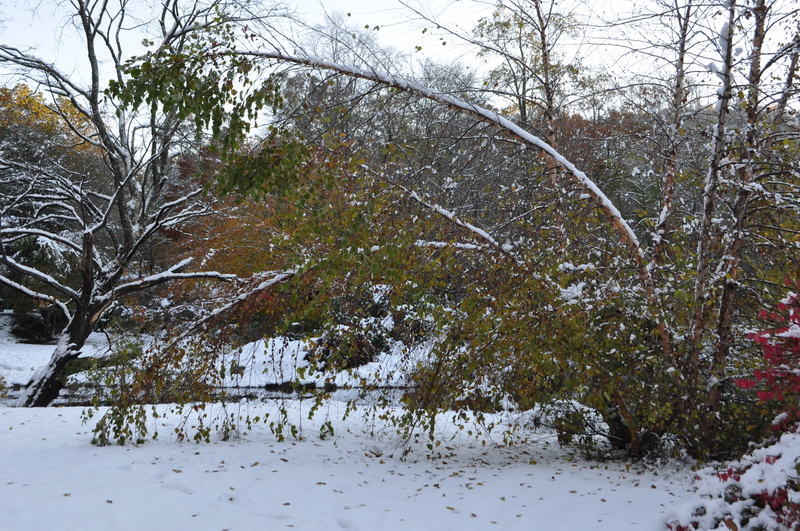 The river birch stretched to the ground. A familiar view from our front yard has never appeared this way before! It feels that Nature is out of sync; she missed a beat. Forgot to take off her finery before coating the Earth with her glistening hand. It seems a haiku moment. This entry was posted in Uncategorized and tagged autumn leaves, dahlias, early snowfall, Habitually Chic, haiku. Bookmark the permalink. Beautiful post, Jayne. You’re going to be raising the bar a bit high for us plodding how-to bloggers, though! Haiku! Glad you escaped the power outage and were able to “make the most of it” with a cozy evening. 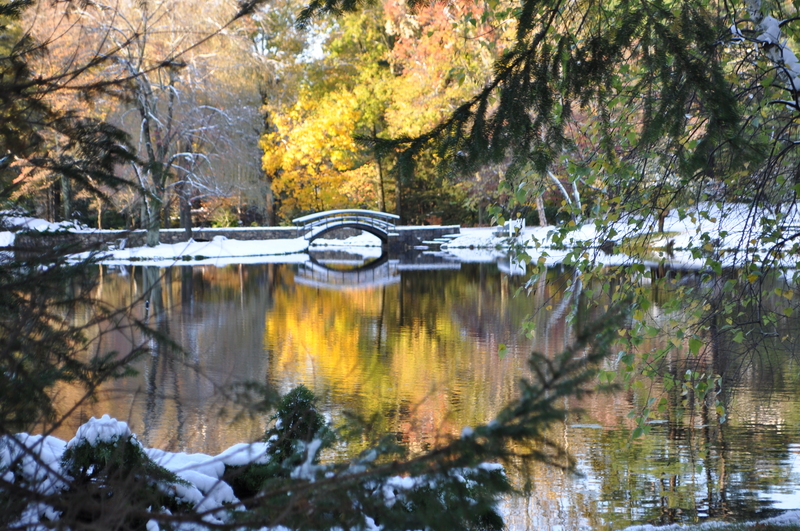 Beautiful photos, particularly the lake and the bridge. Weather patterns have been very strange here in the UK this year. We had a particularly warm and dry Spring, followed by a cool summer and then a mini heatwave in September followed by a very mild Autumn. It’s the 1st November and we don’t need any heating and it’s warm enough outside to wear a light jacket. It all feels a bit crazy. Glad you weren’t affected with your power. Everything looks lovely with snow, but it sure can be dangerous too. Your Cavy’s look adorable. I love that photo of the water and the bridge…breathtaking! I hope the snow did not create too much havoc. 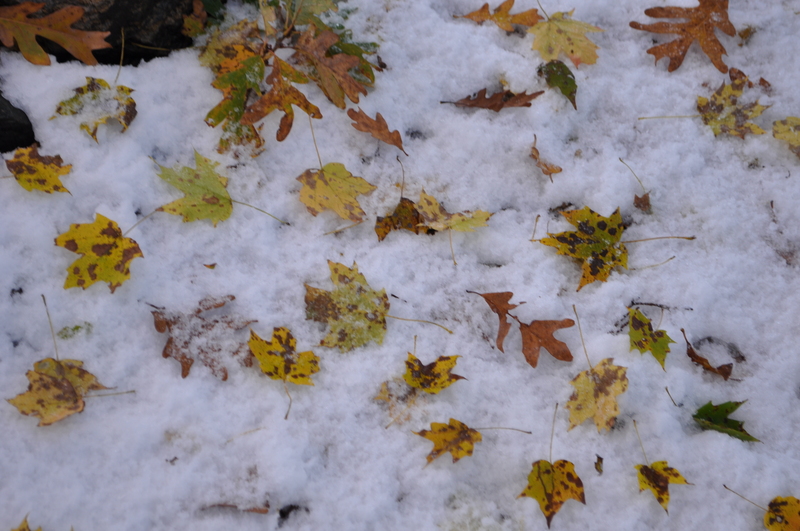 It is very odd to get snow in October here as well. I love snow, but I don’t think I would want it in October. I like it as a blanket over all the dormant plants and trees. Beautiful blog! 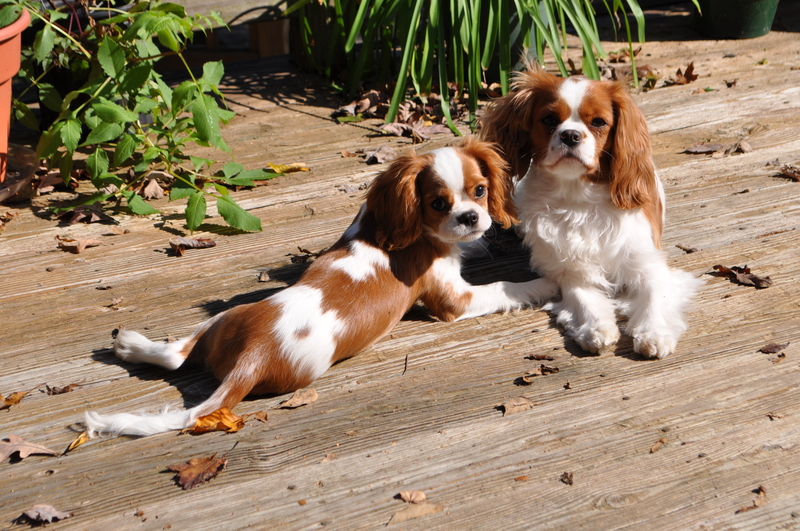 I love the images, especially your precious puppies! Jayne that is a beautiful fireplace! Also a truly stunning capture of the bridge.